Though the Battle For Azeroth beta hasn’t yet begun, the client became accessible late last night and datamining is in full swing. And what do we all care about when it comes to datamining? Is it class changes? Nah. Raid spoilers? Nope. Cinematics? Heck no, G.I. Joe. What we care about is pets and mounts and so far, Battle For Azeroth includes some pretty sweet ones. The most fascinating mount so far is The Hivemind. Its description is so utterly bizarre: “Teaches you how to transform into the Hivemind. Other members of your Hivemind may join with you. This is a flying mount.” We really have no idea how this might work until we can access it in-game. It might be like the Sandstone Drake, where you become the mount and someone else can ride you. In the case of The Hivemind, how many people can enter this mount? How do they enter the mount? Is there a limit to the number of people who can join a Hivemind? The datamined model from Wowhead looks a lot like Yogg-Saron’s brain, and if it’s the final model, there’s no visual location to sit on it. Every passenger would simply be… absorbed. 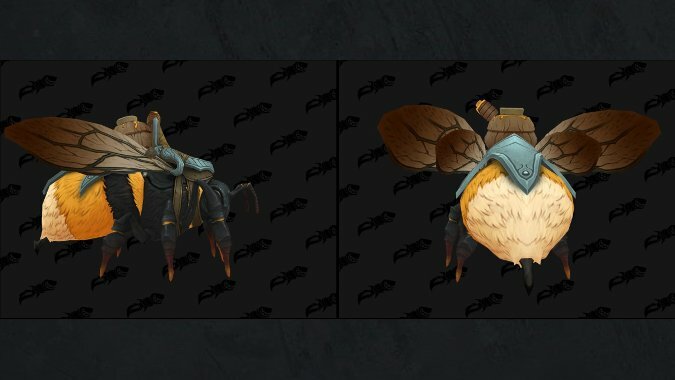 We don’t have a source for this bee mount yet, so all we can do is speculate. Maybe it’ll be a reputation reward — or it’ll be the Battle For Azeroth equivalent of the 2,000,000 gold spider mount. We don’t really know. We suggest checking out Wowhead and MMO-Champion for all available datamined mount models. Again, we highly recommend checking out Wowhead and MMO-Champion for all of the datamined models. They’re all fantastic — Battle For Azeroth already contains some exciting items for mount and pet fanatics to add to their collections.